Rick Perry Blasts Obama 'Appeasement' Toward Palestinians : It's All Politics Besides foreign policy, U.S. domestic politics was also at play Tuesday. Getting the nomination could depend on which GOP candidate can convince the greatest number of the most pro-Israel Jewish voters and evangelical Christians that he is most supportive of Israel. Texas Gov. Rick Perry blasted President Obama's handling of the Israel-Palestinian conflict, Sept. 20, 2011. 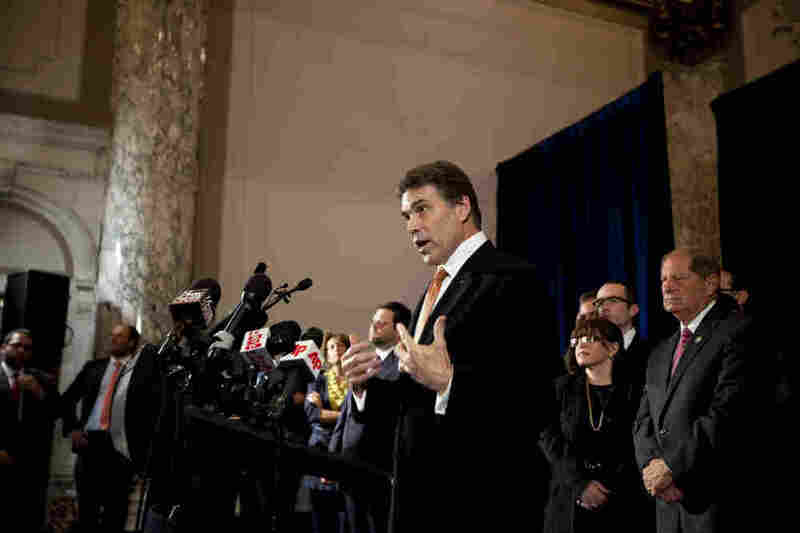 Flanked by members of conservative Jewish groups, Texas Gov. Rick Perry on Tuesday plunged into the morass that is the Israel-Palestinian conflict, alleging that President Obama was insufficiently supportive of the Jewish state. More than that, in a speech before he took questions, Perry accused Obama of "appeasement" in its dealings with the Palestinian Authority. The frontrunner for the Republican presidential nomination made that charge despite an Obama visit to New York at that very moment partly to join the Israeli government in opposing the Palestinian attempt to have the U.N. recognize it as a state. Simply put, we would not be here today at the precipice of such a dangerous move if the Obama policy in the Middle East wasn't naïve, arrogant, misguided and dangerous. There is no middle ground between our allies and those who seek their destruction. America should not be ambivalent between the terrorist tactics of Hamas and the security tactics of the legitimate and free state of Israel. By proposing 'indirect talks" through the U.S. rather than between Palestinian leaders and Israel, this administration encouraged the Palestinians to shun direct talks. What we are watching unfold at the United Nations is an unmitigated diplomatic disaster. It is the culmination of President Obama's repeated efforts over three years to throw Israel under the bus and undermine its negotiating position. That policy must stop now. And fifth, we must signal to the world, including nations like Turkey and Egypt whom we have considered allies in recent years, that we won't tolerate aggression against Israel. "The policies that Governor Perry is advocating are so far out of the mainstream, and would result in so much damage to the state of Israel, that for him Israel must be an ideology or a religious obsession, without a care about the safety and security of the seven million israelis who actually live there and the brave soldiers of the IDF," he said. Wexler said he was concerned, particularly, about Republican threats to defund the Palestinian Authority, and the resulting prospect that the PA's security forces could collapse. "If we actually did what Governor Perry advocates, Hamas would benefit greatly and the Israeli people would pay in blood, as would the Palestinian people," he said. Romney, like Perry, agreed that the U.S. should stop funding the PA if it didn't cease and desist in its bid at the U.N. Romney added that any nation that recognized the Palestinian statehood bid and also received U.S. help should understand that its relationship with the U.S. could change. Ever since becoming president, Obama faced criticism from conservatives that his Mideast policy wasn't pro-Israel enough. That criticism only intensified in May when Obama became the first U.S. president to explicitly say what had before been implicitly understood — that final status negotiations between Israel and the Palestinian government should use as a starting point Israel's borders before 1967 and include mutually agreed on land swaps. Besides foreign policy, U.S. domestic politics was also obviously at play Tuesday. Getting the nomination could depend on which GOP candidate can convince the greatest number of the most pro-Israel Jewish voters and evangelical Christians that he is most supportive of Israel. What's more, as they look towards the general election Republicans are convinced that portraying Obama's policies as betraying Israel helped Rep. Rob Turner, a retired Republican media executive, achieve an upset win in the recent special election in New York's heavily Democratic 9th Congressional District to replace Anthony Weiner. Underscoring that point, Turner stood behind Perry's right shoulder at Tuesday's event.